We are now already midway through the year and thanks to all the hard work of the DCRC board, committees and our Gardner & Gardner Communications (G&G) staff, much has been accomplished! A highlight since our last newsletter was the realization of the DCRC strategic plan meeting in Chicago, May 14-15. I would like to personally thank those who committed their valuable time and efforts to participate in this strategic plan: Todd Bilby, Paul Fricke, Corey Geiger, Stephen LeBlanc, Fabio Lima, Glaucio Lopes, Michael Neil, Matt Utt, as well as the G&G team and Steve Drake, our moderator/facilitator. I would also like to thank those who participated by answering and returning the survey questions, and our members who patiently participated in telephone interviews. Your input and contributions were invaluable to draw a more complete picture of the state of DCRC and its needs moving forward. During this two-day meeting, we discussed important topics regarding the future of DCRC and strategies to accomplish our goals. We are still working hard to finalize a document that will summarize our discussions, findings, actionable items and deadlines as we move ahead to build a stronger DCRC. We will be ready to release our strategic plan at the fall annual meeting in Indianapolis. And speaking of our annual meeting, we are getting closer to our Nov. 14-16 gathering. The program has just been finalized and it will be another exciting meeting. Many thanks to Rafael Bisinotto and the rest of the program committee for all their work to make this happen! The program is full of hot topics and incredible speakers, many of which were suggested by our attendees of the last DCRC meeting and can now be viewed at our website. Reminder: due to contractual obligations, the 2018 meeting kicks off Wednesday (Nov. 14) with a welcome reception, followed by the pre-conference symposium, general sessions and breakout sessions on Thursday and Friday. DCRC is committed to boosting dairy producer and veterinarian (employed by a vet clinic) attendance at its annual meeting. To encourage attendance from these two groups, DCRC is offering twenty $100 stipends. Stipends will be awarded on a first-come, first-come-first-served basis. Contact JoDee Sattler (jodee@dcrcouncil.org) if you are interested in this discount. Again, this year, we had another superb Herd Reproduction Award nomination round with more than 100 nominations! I am truly thankful to the nominators who have helped make this award an important piece of DCRC and of our annual meeting. As usual, another big thank you to Corey Geiger and Hoard’s Dairyman magazine for the great job and its support of this award. One of DCRC’s great educational initiatives is the webinar series. Our next guest speaker is Geoff Dahl, University of Florida, with the topic “The Effects of Dry Period Heat Stress on the Lactating Dairy Cow.” This webinar is set for July 11, 1 p.m. Central Time. This is a great opportunity to combine a high-quality presentation and expert with training and convenience. Don’t miss this webinar! Click here to register. Also, please check our membership promotions and take a few minutes to renew your membership and help get the word out to colleagues and students regarding the value of DCRC membership. In addition, help us spread the word through social media – follow us on Twitter (@DCRCouncil) and Facebook. Your retweets and “likes” help extend the reach of DCRC’s information and programs. Have a great summer and know your DCRC board and staff are working daily to meet your needs. A group of researchers from the University of Wisconsin and Cornell University performed an overview of research that led to development of fertility programs for high-producing, lactating dairy cows, based on gonadotropin-releasing hormone (GnRH) and prostaglandin F2α (PGF2α), with a focus on the role of progesterone in fertility. The results are published in the Theriogenology Journal. The authors considered the key factor affecting fertility to timed artificial insemination (AI) is the response to each hormonal treatment of the Ovsynch protocol. They also highlighted that although not needed for fertility, cows ovulating to the first GnRH treatment of the Ovsynch protocol (G1) have greater pregnancy per AI (P/AI) than cows that did not ovulate after G1. Authors reviewed the association between progesterone concentrations at each treatment during the Ovsynch protocol and fertility in 7,792 cows from 14 studies. Overall, medium P4 (between 0.5 and 6 ng/mL) at G1, high P4 concentrations (>1.0 ng/mL) at the PGF2α, and low P4 concentrations (<0.4 ng/mL) at final GnRH (G2) are associated with greater P/AI. Authors alluded to the fact that presynchronization treatments increased the percentage of cows starting the Ovsynch protocol during early diestrus, which in turn increases the percentage of cows with medium P4 concentration at G1 and with high P4 concentration at PGF2α. Conversely, authors pointed out that some cows fail to completely undergo luteal regression after a single PGF2α treatment, particularly cows that initiate the Ovsynch protocol in a low P4 environment and cows with a young (d 6) corpus luteum (CL) at the time of treatment with PGF2α. Authors reported that the addition of a second PGF2α treatment increased the percentage of cows with complete luteal regression and P/AI. Authors concluded that the use of fertility programs that include the concepts described in their review resulted in more P/AI than inseminating cows after an induced estrus at first insemination. In addition, they surmised that extending these concepts to strategies for resynchronization of ovulation and the implementation of an aggressive reproductive management program for first and subsequent inseminations results in reproductive performance that is unprecedented for high-producing Holstein dairy cows. Researchers investigated the influence of an intrauterine administration of Lactobacillus buchneri DSM 32407 on reproductive performance, uterine health status, and endometrial mRNA expression of pro-inflammatory factors of cows with subclinical endometritis (SCE). The results are available in the Scientific Reports Journal. Authors allocated cows to receive either Lactobacillus buchneri DSM 32407 (n = 56; [LAC]) or a placebo (n = 60; [PLA]) between d 24 and 30 postpartum. Researchers collected endometrial samples from cows with SCE using cytobrush before administration and at three following weeks (n = 16 cows each for LAC/SCE and PLA/SCE). Authors reported that a higher proportion of cows in the LAC and LAC/SCE groups was pregnant after first service, compared with the PLA and PLA/SCE groups (LAC = 45.7%; LAC/SCE = 60.0% vs. PLA = 30% and PLA/SCE = 13.3%). Authors also revealed that median time for conception was shorter in the LAC and LAC/SCE groups than in PLA and PLA/SCE groups (LAC = 103; LAC/SCE = 74 vs. PLA = 133 and PLA/SCE = 164). Moreover, authors indicated that 3 wk after administration the endometrial mRNA expression of CXCL1/2, CXCL3, CXCR2, IL1B, IL8, and PTPRC was lower in the LAC/SCE group, compared with the PLA/SCE group. Authors concluded that Lactobacillus buchneri DSM 32407 improved reproductive performance of cows with SCE and healthy cows. They mentioned that this distinct lactobacillus strain seems to first have a stimulatory effect on the local immune system 1 wk after its intrauterine administration to dairy cows on d 24 to 30 postpartum, which might be beneficial to eliminate pathogenic bacteria from the uterine lumen. Three weeks after administration, the endometrial mRNA expression of several pro-inflammatory factors was down-regulated, suggesting containment of local inflammation – possibly related to the earlier containment of pathogenic bacteria, which in turn might be associated with better parameters for reproductive performance. Researchers explained that cystic ovarian disease primarily occurs due to the failure of the hypothalamus to trigger the preovulatory surge of luteinizing hormone (LH) in response to estradiol. In the ovary, cystic follicles have reduced follicle-stimulating hormone (FSH) and reduced the number of LH receptors. Lipopolysaccharide (LPS), a cell wall component of Gram-negative bacteria, has been shown to inhibit steroid production in vitro. In this study, Shimizu et al. evaluated the involvement of LPS in the physiopathology of ovarian cysts and hypothesized that LPS disrupts steroidogenesis and affects gonadotrophin-signaling pathways via toll-like receptor 4 (TLR4). The study is published at Animal Reproduction Science. Ovaries were collected from cows at an abattoir and follicles classified based on their size and estradiol/protein (E/P) ratio, into preovulatory follicle (POF, follicle >8.5 diameter), estrogen active cystic follicle (EACF; follicle >25 mm, E/P ≥1), and estrogen inactive cystic follicle (EICF; follicle >25 mm, E/P ≤1). Researchers measured the concentration of LPS in follicular and cystic fluid, and expression of LPS receptors and steroidogenesis-related genes in the granulosa and theca cells. LPS concentration was higher in both types of cystic follicles, EACF and EICF, compared with healthy POF. Interestingly, even healthy follicles had a basal concentration of LPS. In granulosa cells, the expression of LPS receptors TLR4 and TLR2 was greater in EICF than in EACF and healthy POF. In thecal cells, the expression of TLR4 was higher in EICF, compared with other follicles. Expression of luteinizing hormone receptor (LHR) in granulosa and thecal cells was lower in EACF and EICF, compared with healthy POF. Expression of steroidogenic acute regulatory protein (StAR) in granulosa and thecal cells was higher in EICF, compared with EACF and healthy POF. Expression of aromatase cytochrome P450 (CYP19) in granulosa and thecal cells was decreased in EACF and EICF, compared with healthy POF. Authors concluded that high concentration of LPS is present in the follicular fluid of both types of cystic follicles, EACF and EICF, and the expression of LHR is low in cystic follicles, indicating a possible involvement of LPS in the pathology of cystic follicle disease. Even in northern climates, heat stress happens – impeding calf size, lactating and dry cow health, milk yield and ultimately dairy farm profitability. University of Florida’s Geoffrey Dahl, who spoke at the 2017 Dairy Cattle Reproduction Council (DCRC) Annual Meeting, described heat stress as when the environmental temperature is greater than the animal’s thermoneutral zone. Air temperature, relative humidity, air movement and solar radiation are environmental factors that influence the intensity of heat stress. While dairy producers see the immediate impact of heat stress on lactating cows, heat stress “silently” hinders dry cows and their unborn calves. Heat stress during the dry period reduces productivity in the subsequent lactation, resulting in estimated economic losses, on a per cow basis, of $337 and $383 for the states of Florida and Texas, respectively (Ferreira et al., 2017). Additionally, heat stress negatively influences the immune status of dry cows as evidenced by decreased lymphocyte proliferation and lower antibody production to a non-specific antigen (do Amaral et al., 2011). Therefore, increased immune activity of cooled cows may lead to superior mammary gland involution during the early dry period and consequently improve cell proliferation during the late close-up dry period, which may explain the greater milk yield of cooled compared with non-cooled cows (Tao et al., 2011). Heat stress during the dry period negatively affects mammary gland development and subsequent lactation when compared with cooled cows (Tao et al., 2011). The economic losses don’t end with lactating and dry cows. Another study (Monteiro et al., 2016) demonstrated that heifer calves exposed to in utero heat stress produced 11 pounds (5 kg) less milk per day in their first lactation than control heifer calves that were exposed to prepartum evaporative cooling. When do cows start experiencing heat stress? According to Zimbelman et al. (2009), the effect of heat stress kicks in when the temperature humidity index (THI) is greater than 68. Click here to view Dairy Cow THI chart and compare with Human Heat Index chart. To alleviate heat stress, apply housing interventions, such as shade to block direct solar radiation, water spraying to increase conductive heat loss, and ventilation to improve convection and enhance evaporative cooling (Ryan et al, 1992). Well-designed shade reduces the heat load on cows by protecting cattle from solar radiation. This protection helps reduce rectal temperature and respiration rate, which helps increase milk yield and conception risk. In addition, cows exposed to shade during the last trimester of gestation tend to have greater body weight, compared with cows not provided with artificial shade. Dry cows with greater body weight tend to have heavier, healthier calves. To make an even greater heat stress relief impact, provide evaporative cooling. Cows exposed to evaporative cooling (combination of soakers and fans) produce more milk than cows maintained under open shade (Armstrong et al., 1988). Sprinklers must create water droplets large enough to wet the cow`s hair coat to the skin while fans create air movement over the cow`s body. This improves evaporative cooling at the skin level and thus increases heat loss to the environment (Renaudeau, 2011). “Apply water intermittently to allow time for moisture to evaporate from the skin,” said Dahl. Under arid conditions, dairy producers may use a fogger or mister system. These systems can be used in high humidity regions during daytime hours when humidity is relatively low (Renaudeau, 2011). When used with forced air, sprays providing a fine mist on cows’ body surface improve milk yield under heat stress conditions (Ryan et al., 1992). Misters may be applied on the feedline. However, these systems have had little success in improving animal productivity in humid areas without fans to improve air flow across the skin (Armstrong, 1994). A recent heat stress study compared early vs. late dry period timing effects: 1) cooling during the entire dry period; 2) heat stress during the entire period; 3) heat stress during the first three weeks of the dry period and then cooling until calving; and 4) cooling during the first three weeks of the dry period and then heat stress until calving. Cows exposed to heat stress at any time produced 8.8 pounds (4 kg) less milk per day than cows exposed to prepartum evaporative cooling during the entire dry period (Fabris et al., 2017b). “Thus, it seems that exposure to heat stress at any time during the dry period negatively affects future milk yield,” said Dahl. Another “cooling strategy” is to introduce genetic characteristics that improve thermoregulation. 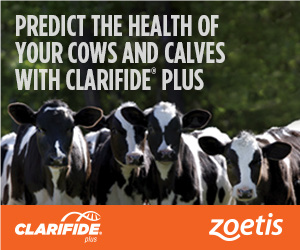 “The ‘slick’ phenotype, which is found in Senepol cattle, has been introduced into the Holstein breed by crossbreeding to improve thermoregulation,” said Dahl. The slick phenotype yields a short and sleek hair coat. Dikmen et al. (2014) demonstrated that cows with slick hair have improved thermoregulatory ability and experienced less milk yield depression during the summer season. In conclusion, strategies that help a cow better thermoregulate will aid in reducing her respiration rate and rectal temperature, and improve milk yield during the next lactation. In addition, strategies that improve immune function may accelerate mammary gland involution and increase cell proliferation during the late dry period. Implement strategies that reduce the negative effects of heat stress during the dry period to improve cow performance and ultimately increase dairy farm profitability. A large animal veterinarian, Kristen Edwards works for Tavistock Veterinarian Services, which services both companion and large animals. The large animal team includes eight veterinarians, practicing 95 percent dairy production medicine in Ontario’s dairy belt. Kristen spends most of her time with dairy cows, with duties split between regular herd health visits, data analysis and consultation, protocol development and bovine emergency medicine. Hailing from southwestern Ontario, Kristen took a road less traveled to become a bovine practitioner. She grew up in the city but worked on dairies in Ontario and Ireland. “These work experiences helped me better understand the industry at the producer level,” she said. Kristen also worked on a cow-calf operation in northern Ontario one summer during veterinary school. In Kristen’s eyes, DCRC provides updates on the newest reproduction strategies and technologies available. 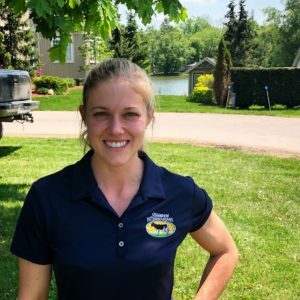 “It allows practitioners to share the most current information and tools with our clients to improve reproduction efficiency and farm profitability,” said Kristen. For example, Kristen started adding a second prostaglandin in synchronization protocols, such as Ovsynch and GGPG (GnRH-GnRH-PGF2alpha-GnRH), after attending a DCRC event. This tactic typically yields improved conception. Also, she became more diligent about monitoring body condition score changes during the first 65 days of lactation and implementing management or dietary changes after learning about the large drop in cyclicity (81 percent to 59 percent) and conception (42 percent to 29 percent) in animals losing one body condition score or more.